The F-15 that was critically damaged in an emergency landing after being hit by a flock of pelicans, took off for the first time. 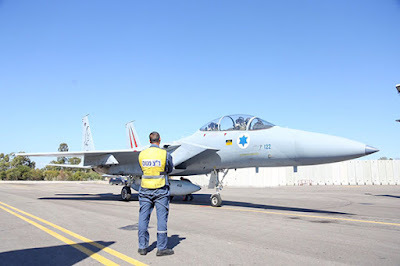 This morning, an F-15 that was hit by a flock of pelicans in 2011, took off for its first sortie since returning to the Israeli Air Force “Edge of the Spear” Squadron after a long reconstruction period. The aircraft was operated by pilot Lt. Col. Rotem that flew it when the accident happened. “The aircraft is back in the playground and has become an operational aircraft in the IAF. It proved excellent capabilities in aerial combat, flew and maneuvered like the first time I flew it before the accident. You can feel its soul”, shared Lt. Col. Rotem, minutes after landing. “Last time the aircraft landed in the squadron it was an emergency landing after which the aircraft was defined as a ‘total loss’. Taking this jet for its first sortie was a challenge for the squadron’s technical department. We were able to take off for the first sortie thanks to them and their hard work”. The “Edge of the Spear” Squadron’s personnel felt the absence of “Baz” (F-15) tail number 122 and this morning, after a continuous five-year restoration period, they were excited to see it taxi its way from the squadron to the runway and take off once again. 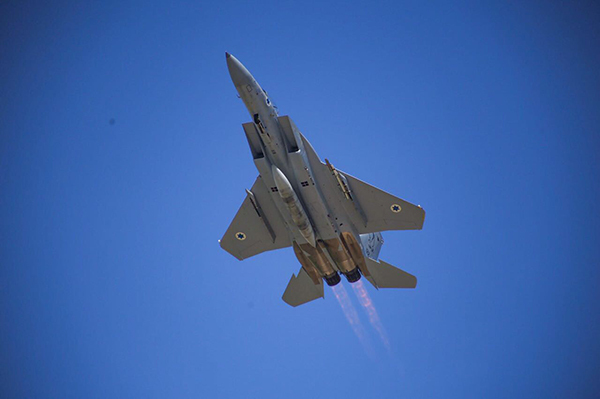 “’Baz’ 122 is an incredible combination, a testimony of the IDF and IAF’s greatness. What started as an unexpected, serious accident that was met by a very high level of professionalism displayed by the aircrew who managed to land the aircraft, ended, to my great pleasure, with a border-crossing project pushed by many elements to return the aircraft to the order of power”, said Lt. Col. Ilan, Commander of the “Edge of the Spear” Squadron. “Working on the jet helped us learn about the ‘Baz’ from the inside and the IAF will use the knowledge we gathered in this project in order to renovate and begin operating the double- seat F-15 jets that arrived from the U.S last year and that will be integrated in the Israeli ‘Baz’ squadrons”. The incredible story of “Baz” 122 began in July 2011. The aircraft was hit by a flock of pelicans a few minutes after taking off for a routine Air-Air combat training exercise and the pilot and WSO immediately performed an emergency landing. The damage caused to the aircraft rendered it inoperable and it was subsequently grounded. Nevertheless, the IAF’s Aerial Maintenance Unit didn’t give up. In a unique engineering project, the rear part of the damaged aircraft was replaced by the rear part of a different, single-seat “Baz’ (F-15) which wasn’t used for 20 years. Despite both being F-15s, the aircraft were not identical, so the connection between them required creative thinking from the unit’s personnel. After being restored in the AMU, the fighter was transferred to the IAF’s Test Squadron about three months ago and underwent and number of successful test flights. “This globally unique project was based on the IAF’s technical divisions professionalism and determination and the IAF’s capability, in the field and HQ, on the ground and in the air, to cooperate for a mutual mission”, said Col. Gadi, Commander of the IAF’s AMU. “We will write another chapter in the history of the unit and the technical division when we get the plane back to full operational capability”.